Me and my art buddy. Every weekend for the past month, I’ve been climbing stairs, high and low, and in and out of a variety of city districts, to look at contemporary art in this great city. The 13th Istanbul Biennale started on September 14, 2013, and a wide variety of galleries, museums and public art spaces have put their best foot forward. Amazing exhibitions and installations are being shown from one corner of the city to another. Before I left the USA, I was reading many blogs about Istanbul written by people that were living here. When the riots started in June, I used these sources to stay abreast on the conditions in the neighborhoods that I soon would call home. Through my research, I came across a blog that I enjoyed because of the rich photos and personal commentary. After reading many articles, I decided to write the author and compliment her on her work of maintaining her blog. As it turns out, she wrote me back. Then I wrote again, etc., etc., and low and behold, once I moved here in August, we met face-to-face and have become friends. She, too, is an artist and we both belong to PAWI (Professional American Women in Istanbul) and Artists in Istanbul. My new friend, who has lived here almost a year, knows the city, and its language, better than I do. With Google maps in hand (and on iPhone), we’ve started conquering these exhibitions, one neighborhood at a time. When I step into these venues, and catch my breath, I think, “I’m going to write about this!” but then I go to the next one, and the one after that, and the one after that, and by the end of the day, I’m completely confused on what to write about. Too much to choose from! 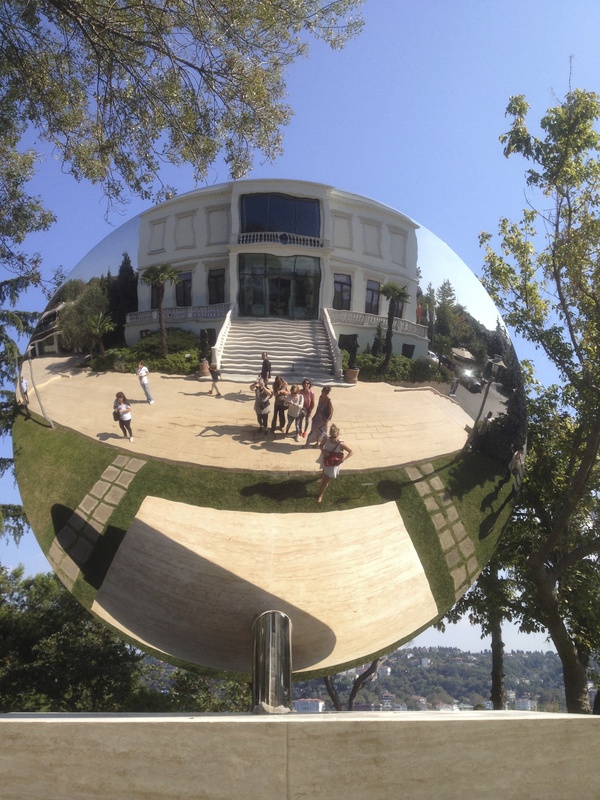 Today, I’ve decided to share with you photos from the stellar Anish Kapoor show at Sakip Sabanci Muzesi, north past Babek and close to the shores of the Bosphorus. Anish Kapoor is an Indian-Brit. His work being shown here in Istanbul covers the last 25 years of his career. As I looked at the monumental pieces of steel and marble I kept wondering how they got here; how did those enormous pieces make their way into this beautiful, but crowded, neighborhood on the Bosphorus? I rode the bus to get there and it took an hour. It’s not that far of distance, but the roads were so crowded with cars, motorcycles, buses, melon carts, pedestrians that it felt like I’d never arrive. Did the sculptures float up the Bosphorus on a barge? Did they arrive on a truck up the steep hills of the city? This would have been an interesting installation to see! Americans may know his large, chrome-like “bean” the best. It sits in Chicago’s Millennium Park and is wildly popular. The sculpture’s title is actually, Cloud Gate and, although it went way over budget (to the tune of about $25 million) the city of Chicago and its residents love it! His most recent piece, Ark Nova, is a one-of-a-kind inflatable concert hall in Japan. I’m going to let the photos speak for themselves. The work was mesmerizing and provoked curiosity. How did he do this? Were the pieces fabricated by machines? How many assistants does he have? I’m so fortunate to have been able to see this exhibition. It’s up through January sometime in the event you want to see it!